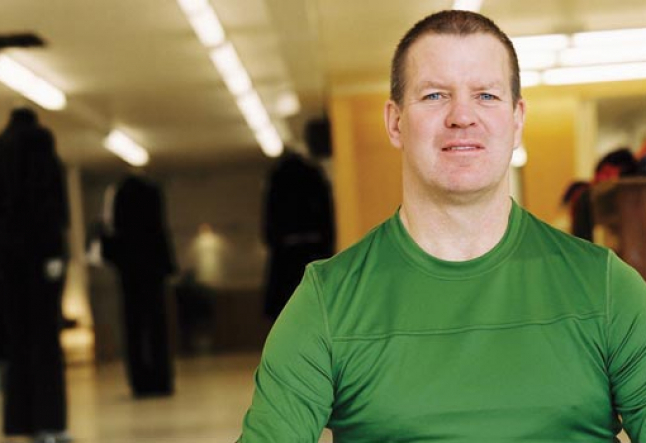 Chip Wilson, father of five boys and founder and chairman of Lululemon Athletica, arguably the most iconic yoga/athletic apparel and accessory line in North America, has enjoyed a lifelong obsession with athletics and high intensity, high impact sports. The same could be said for his taste in business ventures. In 1986 Wilson founded Westbeach Snowboard Ltd., a surf, skate, and snowboarding business that effectively brought the West Coast boarding culture to Canada. After turning Westbeach into a profitable apparel and sporting goods retailer, Wilson sold it to Morrow Snowboards, a company based out of Portland, OR. Deciding to run a business is also making the decision to go with the flow and be flexible, to make adjustments as the need for change arises. “Originally, I got into Ashtanga and didn’t really know there were any other types of yoga classes out there. It’s just like when I was in the snowboarding business; there was regular boarding at the start and then there was racing, downhill, and then back country. It allowed for the creation of different types of clothing meant for each one. And that’s kind of what I saw happening in yoga.” Wilson began developing different variations of functional clothing for different styles of yoga. For hatha blend-style classes with relatively low impact, Lululemon looks toward warm and stretchy garments that don’t bag; for Bikram and other heat-based practices, they design really light items; and for Power and Ashtanga, they use Lycra® and nylon pieces with a lot of stretch and movement. Staying aware of yoga’s evolution and its different facets is an essential component of Lululemon’s success. Instead of getting stuck in one idea of what yoga clothes were and are, Wilson keeps his sights on the current trends and needs of the yoga community. Adjusting design theories wasn’t the only part of Lululemon that went through a shift as the business grew. The initial mission statement was providing components for people to live longer, healthier and more fun lives. “We started to see that as limiting and so we moved that to the mission statement for our design team. Then the mission statement for the company became moving the world from a place of mediocrity to greatness.” It might sound like a lofty statement, but Wilson and all of his Lululemon employees take it very seriously and embrace it wholly. At corporate headquarters in Vancouver, there aren’t many traditional offices. People sit in pods, helping to further the sense of community Lululemon strives for. When Wilson was offered a big corner office this year, he felt uncomfortable; after only a short while he was back on the design floor, just one of 50 desks. Wilson clearly walks the walk when it comes to his philosophy that all employees are equal. Not only did he reposition his desk, but he requires all of his employees, no matter what level of seniority, to work the store floor once a week. Employees are placed where they can see firsthand the work they do. A designer, for example, would work the fitting rooms and listen in on the comments customers are making about fit and style. Wilson encourages personal development for all his employees by having them work their way through a library of books he selected, emphasizing different topics he thinks everyone should read to get in touch and get ahead. Another contributor to employee happiness at Lululemon is the practice of goal setting. Employees who feel on task and have a strong idea of what to strive for are more productive and content. They are asked to set personal, career and health goals for the next two, five and 10 years. Lululemon workers aren’t just happy with the status quo; they’re always striving and always out in the open with what they’re striving for. The Vancouver office houses a yoga studio that offers employees classes five days a week, one at noon and one after work. In addition to the in-house classes, all employees are offered two paid-for classes in the community at affiliated yoga studios. This not only keeps staff healthy and balanced, but it gets them out and about in the yoga world, testing products and talking to students. Other unique benefits include showers, which are provided at most Lululemon stores to encourage employees to walk or bike to work in warm months and participate in business meetings atop Grouse Mountain, a local peak in Vancouver where Wilson encourages his colleagues to hike with him to the top. Lululemon currently has over 6,000 employees. While the hiring process is selective, they welcome anyone who’s inspired by what they see to apply. When hiring, Lululemon looks for people who have and aspire to have greatness in their lives. People who are enthusiastic, passionate, feel responsible for their own lives and are determined to get the most out of it, are encouraged to apply. “People are usually attracted to the company and want to find out what’s so great about it, so it’s pretty easy to hire and it’s pretty easy to enroll people in our training program — they’re usually inquiring about it just stepping into the store,” says Wilson. Instead of using professional models, Lululemon uses ambassadors, specially selected instructors, athletes and other role models in the community who embody the Lululemon spirit, to model their clothing. Using real people gives the company real feedback and furthers its concept of function and utility above all else; if this actual yogi is wearing these pants, then why shouldn’t you? Feedback is an essential part of the unique Lululemon culture. In the stores, whiteboards or slips of paper are available where customers can write in comments for how to improve pieces; this is where a lot of success in the detail and function of the fabric have really come through. Because they’re based on the West Coast and have pieces moving to places like Tokyo, Hong Kong and Australia, it makes sense for Lululemon to manufacture most of their clothing in Asia. “But we keep 20% of our production here in Vancouver, though, for turnover. So if we hear from local athletes and yogis, ‘Gee, I wish I had a garment that looked and moved like this’, we try to get on it right away, get it out in stores and see what the general populus thinks.” Wilson is tapped into the fact that the world moves fast and if you don’t keep up, you’ll lose business. In keeping with the company’s philosophies, Lululemon has always strived to be ecologically responsible and green, using things like recycled floors, half-flush toilets, LED lighting and non-toxic paint in their headquarters and stores. Currently, Lululemon is working with its network of ambassadors and local yoga studios to expand their outreach and turn their stores into community epicenters for health-related resources. Ultimately, they want to be a go-to spot for people to turn for education on healthy and inspired living. Employees are proud of their eclectic community boards, which are hung in each store and showcase anything from local yoga and health events to information about the staff and their goals.